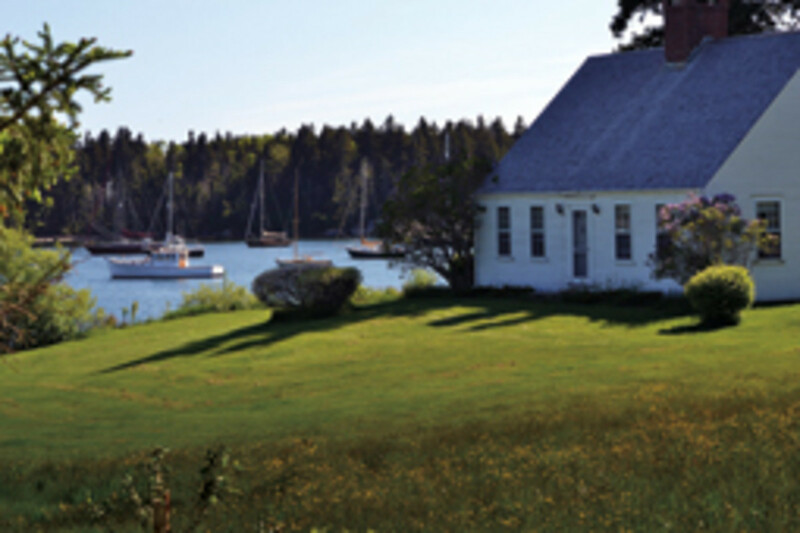 “This house is the culmination of my father’s lifelong dream — to retire with my mother to the coast of Maine in a comfortable, relaxing home that blended into the area,” says Tom Hamilton of Brooklin, Maine, who also retired here after cruising and summering in this wooden boat mecca for most of his life. 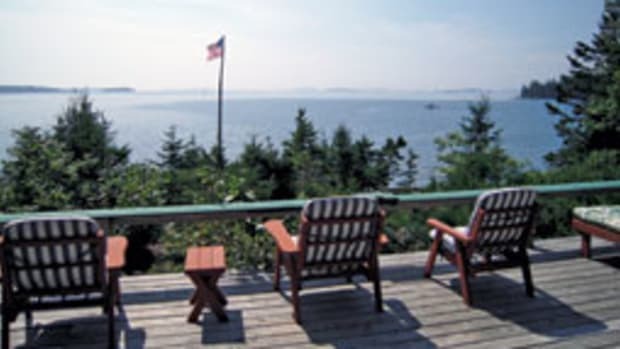 His home’s spectacular view of the boating activity in Center Harbor and Eggemoggin Reach beyond Chatto Island is a bonus. 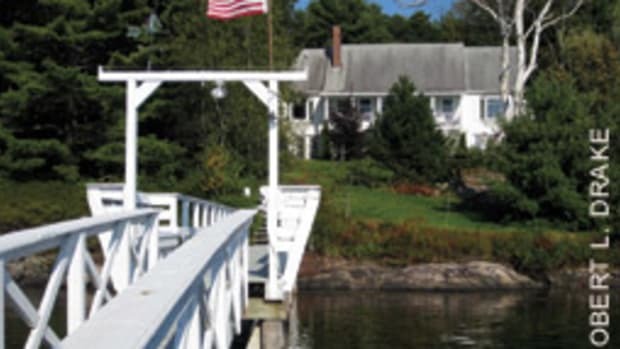 Hamilton’s parents built their Cape Cod-style house on property purchased in 1964 from boatbuilder Arno Day. They persuaded the architect to include the traditional large central chimney, 12-over-12 windows and cedar-shingled roof of the proper pitch. 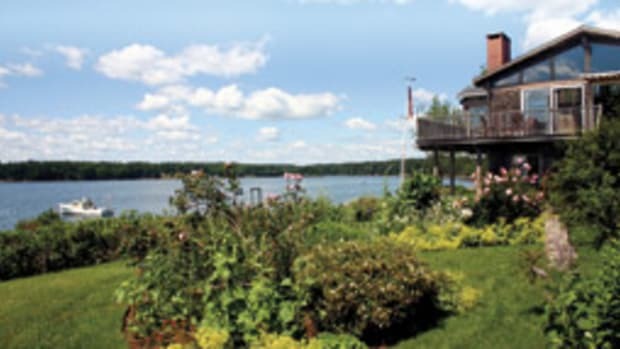 Hamilton, along with his co-owners — his sister and sister-in-law — are offering the 1.6-acre property with 204-foot water frontage, a three-bedroom, two-bath year-round home and an attached 2.5-car garage for $1,199,000. 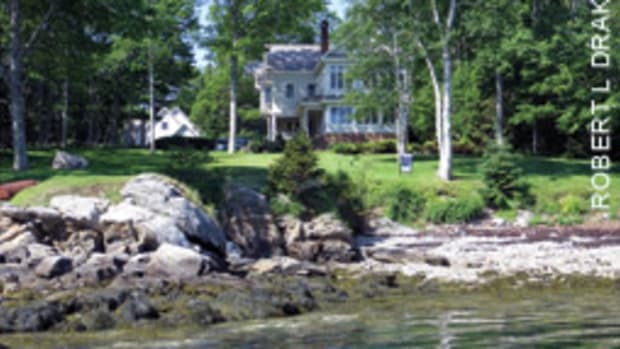 “This is the first piece of Center Harbor shorefront for sale since 1964 and may be the last for a long time,” Hamilton says. 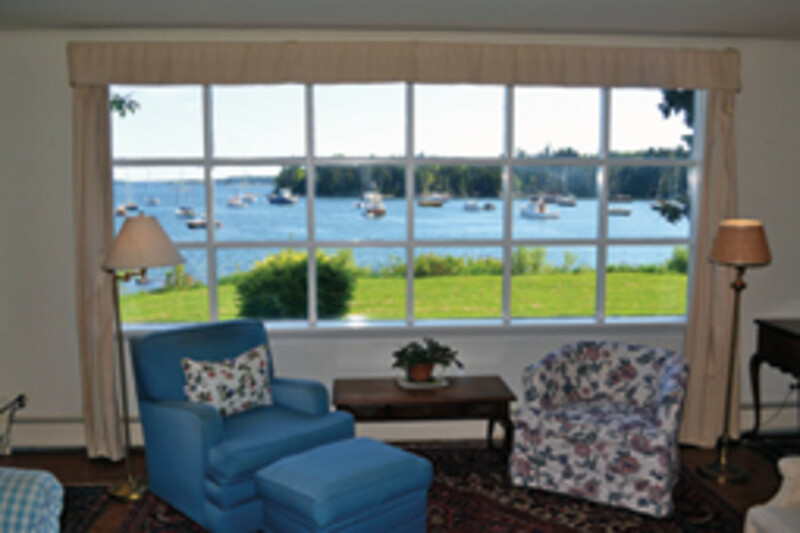 The living room in the classic cape fills the south end of the house, giving it panoramic views of the harbor. 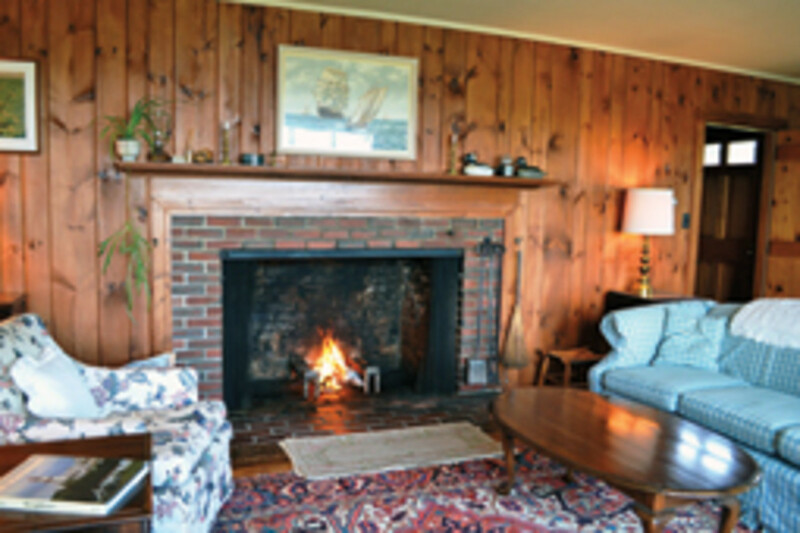 In the offseason, the family liked to gather in the wood-floored, pine-paneled living room and light a fire in the brick fireplace. The carpeted master suite and its private tiled bath occupy the north half of the house. In the ell is the country eat-in kitchen. The spacious room, equipped with modern appliances, exudes a comfortable, traditional ambience because of its pine-paneled walls lined with custom cabinets with matching pine-louvered doors. Although two bedrooms and a bath are upstairs in the main house, with nearly private outside access through the front door, Hamilton’s grandchildren prefer the rustic bunkroom (with exposed beams and harbor views) above the kitchen. 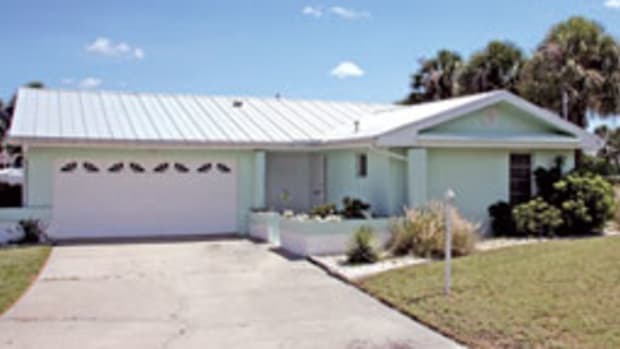 Three-zone, oil-fired hot water baseboard heat allows the family to close off the upstairs in the offseason, saving on fuel costs. The south-facing living room window also helps with solar heat, Hamilton says. For air conditioning, they open a window to catch the prevailing breeze. The attached 2.5-car garage has plenty of room for a workshop and small boats because Hamilton’s father specified that no posts obstruct its interior. 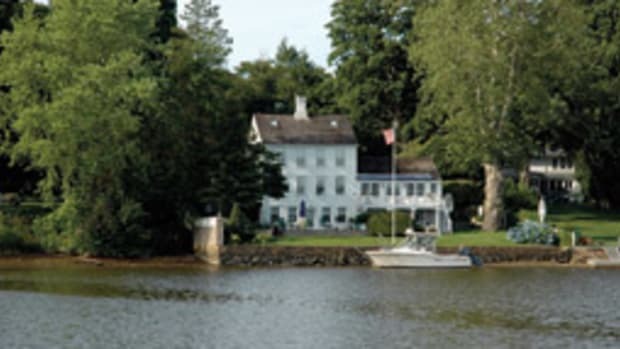 Though very privately located on 1.6 acres, it is in the middle of Center Harbor, a village that retains its old-fashioned, small-town ambience. 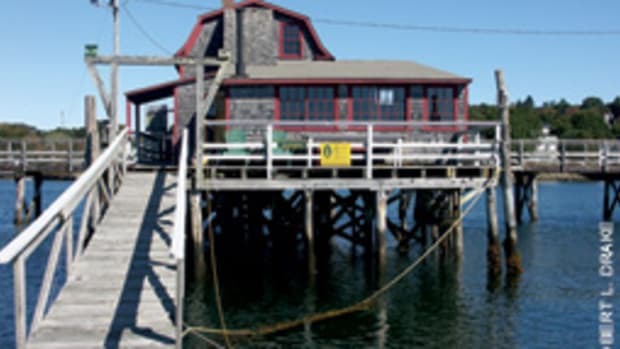 The general store, library and yacht club are within walking distance. Nearby are shops, galleries and restaurants in “downtown” Brooklin. Twelve miles away, the neighboring town and arts center of Blue Hill has churches, supermarkets, a hospital, services, galleries, boutiques and music and drama performances. 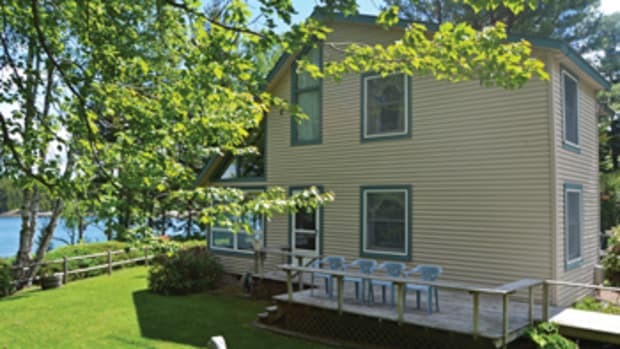 The property has a private well and a septic system. Annual taxes are about $6,000. Jamie O’Keefe of The Knowles Company, Northeast Harbor, Maine, (207) 276-3322, www.knowlesco.com, lists the property.